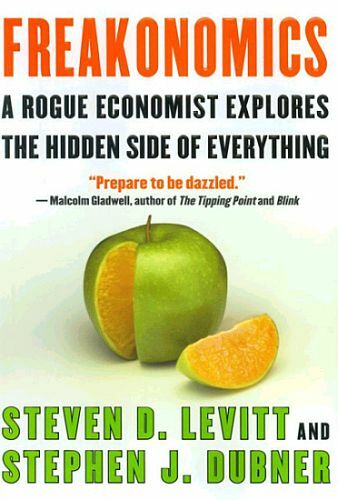 Freakonomics: A Rogue Economist Explores the Hidden Side of Everything is a treat to read, I wonder why didn’t I pick it up before. I’am sure am gonna read the sequel as well. Talking about this book, it is divided into six chapters, randomly talking about events and occurrences and then the authors delve back to the nearest probable reason(s) which in most of the cases, hits back to the causes that have been asserted by the respective experts at the times. Deftly, the authors have been able to prove the logic of their empirical results by joining the coordinates from different quadrants. One thing that I find consistently within this book is the idea that imperfect information leads to market failure. In situation like this, the market fails to allocate a society’s resource in an efficient manner. The book helps us in widening our mind’s horizons by not taking the common wisdom as is. It encourages us to question and think beyond conventions and utilize the knowledge and learning by giving a wider perspective to information. I would also like to point out the socio-economic analysis that the writers have presented within the book. Main purpose behind incentive(s) is to make a person do a particular task or reinforce individuals to achieve a certain target set by the person in authority. However, the trick does not work in tandem with the expected outcome all the time. Before setting any scheme of incentive, there happens to be a guilt for not performing the expected task but once the scheme is put forth, the guilt takes a back seat and is replaced with the acceptance of doing otherwise. A situation that is demonstrated by the day care center in Haifa, Israel. When parents were imposed with fine for coming late, the scheme backfired and number of latecomers increased. Since the fine eclipsed the sense of guilt within some parents. Incentive also applies in unexpected ways, for instance teachers might also cheat. In order to get their good result in terms of their students’ higher grades , they do not think twice in tweaking their students answer sheets. Similarly, Sumo wrestler in Japan might not give his hundred percent only to maintain the opponent’s existing ranking. In order to maximizing utility, customers will not deter away from cheating, even if it means, cheating for few cents. As W.C. Fields said, “a thing worth having is a thing worth cheating for”. Information is an influencing tool, which people who have can exert over those who have not. Ku Klux Klan enjoyed a hey-day during its initial years in the US but with the dissemination of the inner “secret” information, there came its downfall. What Levitt here is trying to say is, in the current scenario, the real estate agents, on the buyers and the sellers of a property, exert the same power. With their relative knowledge of local market and its current situation, they experience a superior power over their clients’ –buyers as well as sellers – fear. Inflation in real estate is solely the work of real estate agents, who exploit the buyers and sellers only for their personal gains at the stake of the underlying information, which forms it economic value. Incentives matter for buyer as well as seller. So the intermediaries does not invest their effort to reach at the highest possible price rather, they have a mentality of wrapping things quickly. After all, faster a deal is closed, quicker they’d be for the next target, which means, more selling and more commissions and more currency. The section also talks about other case studies including funeral directors and car salespersons that gain from informational advantage by make full use of and derive benefit from informational asymmetries. So long as the external conditions are satisfied, and both the buyers and sellers are perfectly equipped with information, the market outcome will be efficient, which however turns inefficient in the presence of real estate agents. Subsequent section deals with the theme called the conventional wisdom is often wrong. Levitt and Dubner further add that the wisdom is not only wrong but it is hard to correct, reason being, specialists or the experts within the field have fabricated it. They have reached to the conclusions without resorting to the verity and the situation becomes worse when the subsequent experts further echo the same conclusions. Once this information gets into the spiral gyre of experts and professionals, the loop keeps on rebounding till the extent that it becomes an accepted norm by the society at large, which makes it a tricky social problem, a sacrosanct to go against. Levitt and Dubner then talk about the variety of explanations put forth by the experts in the national leading newspapers that lead to the drop in crime figures during the 1990s in the US. As per them, the main causes that directly resulted in the drop in crime rates were, new ways of approaching strategizing policies, increase in the effectiveness of prisons, changes in drug market, strict laws over gun control, longevity of population, escalation in economy and growth in the number of police personnel. However, these causes were only the tip of the iceberg; legalization of abortion in 1973 was the one of the most significant reason for reduction of crime rate, a factor that was simply overlooked by the respective experts. Next chapter surfaces the two sides of the same coin – what parents do versus what parents actually are. Parents give good atmosphere to their children, supply them with books, limit their television time, provide them with toys, mother prefer to stay at home to look after the infant are some of the factors which the parents think by performing they’d enhance the overall academic and life of their children. They think that by doing these things, they would influence their children’s’ thought process, which would make them a go-getter, a winner in academia and life. However, Levitt and Dubner claim that these again are just minor factors; the overall personality development of children is the result of what a parent is than what a parent does for the children. I find that the examples were fairly knitted with logics, which made readers think and that is the best thing of reading, it initiates the thinking process. Offbeat analysis of mundane open-ended questions, strongly recommended.